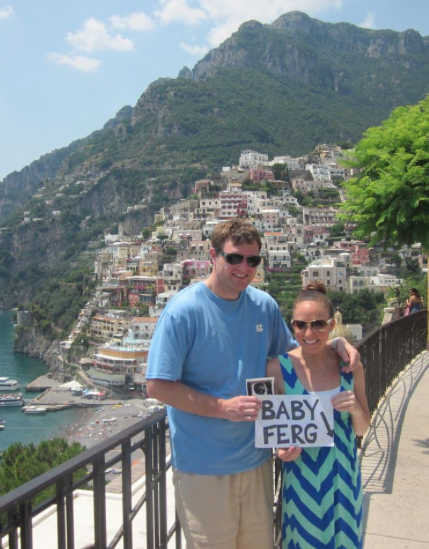 Ferg Family Adventures: Baby Ferg! Baby Ferg is due January 31, 2014 and we couldn't be more excited!!!! *How have you been feeling? I had terrible "morning" sickness (with morning in quotes because it was not just in the morning, but all freaking day long!) during weeks 6-8, but my doctor gave me zofran and that stuff is amazing!!!! So now I am feeling good! *Are you going to find out the gender? YES!!! Plans for our gender reveal party are already in the works...I just wish I didn't have to wait till September!!! *What do you think Baby Ferg is? I've thought girl from the start, but lately, I've been going back and forth all of the time. So confusing, and so hard to predict! I just want to know!!!! *Wait...you just went to Italy. How did you do that and not drink any wine?!?!? I know. The orginal plan was to wait to get pregnant till we got back from Italy. But honestly, it was fine. I was so thirsty all of the time from walking around all day that when we were at lunch/dinner, I just wanted to chug water! I did have a few very, very, very small sips of Trav's wine if he said it was really good. I also had a small sample of limoncello (it was literally 1/2 a sip! )...I just had to! Baby is a very good traveler too, I may add. I rarely got sick the whole trip (thank you, zofran) and sometimes, even forgot I was pregnant (for like a hot second)! *Will you post bump pictures? Yes! Just like with wedding planning, this is a very special time in my life and I want to remember it all (even the morning sickness)! So, lucky for you, I'll be sharing weekly updates on this little blog of mine!! I'm hoping that this pregnancy won't completely take over the blog, and I'll be able to share some other, non-baby related things on here too. Please let me know if I get too out of control! I'm also thinking I need a new blog name...since the current one was my mantra during wedding planning, and well, I haven't really been cravings cupcakes recently! Any suggestions?!?! I have been waiting for this post! Congratulations!! Can't wait to read all about it! Exciting! Congrats! If you have a girl I have a TON of winter clothes I'll sell you for cheap. Many Shelby has only worn 1-time! Congratulations!!!! So excited for you!! !